For the fifth year running, Dancer Geeta Chandran, Founder-President Natya Vriksha has been observing World Dance Day with extremely interesting fare. 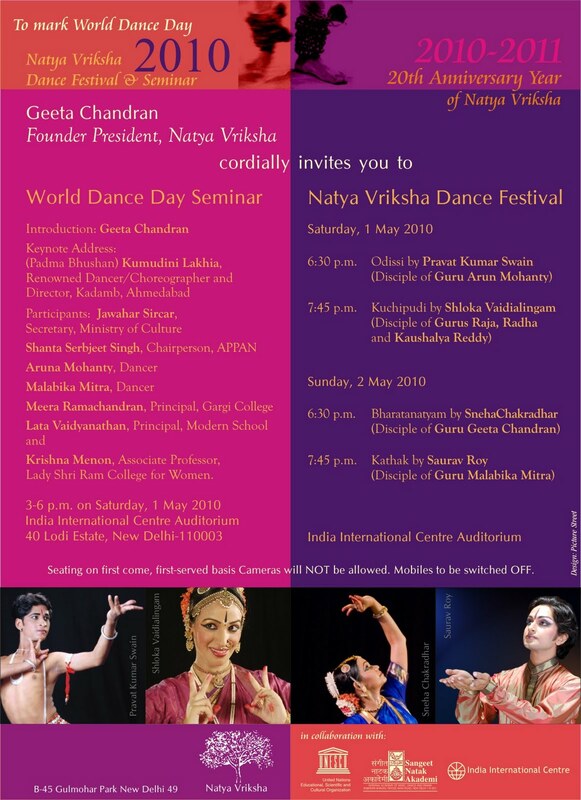 This year the seminar (Saturday, 1 May, 3-6 P.m.) focuses on the critical issue of Classical Dance and the creation of Value. "That dance creates value for dancers is only too well-known", says Chandran. But what value does it create for other sectors like Society, Community, the State, the Sponsor, the Student, the Audience, the Media, the Critic, the Academic? The discussion by a panel of eminent dancers from all over India will be catalysed by a keynote address by (Padma Bhushan) Dr. Kumudini Lakhia, Kathk dancer/choreographer from Ahmedabad. E-Invite is attached. KINDLY SPREAD THE WORD!